When a support site with iOS configuration profiles enabled detects a request from an Apple iOS device, it displays a link to the profiles page. From the profiles page, the customer can download public configuration profiles or submit an access key to download private configuration files. When a representative generates an access key and provides it to the customer, the customer can either submit the access key code on the iOS page or go directly to the access key URL. Either action will take the customer to a page listing the configuration profiles for which the support representative generated the key. Once the access key has expired, it can no longer be used to view or download private profiles. Selecting a profile name displays its description as set in the administrative interface. When the customer taps Install, the iOS device displays further details about the contents of the configuration profile. The customer should then tap the second Install button. An alert notifies the customer that installing the profile will change settings on their device. 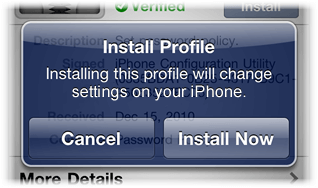 Once the customer taps Install Now, the profile is applied to the iOS device.